That’s right Duck fans, tonight is the night! The No.17 Utah Utes will host the No.4 Oregon Ducks in a highly anticipated showdown at Rice-Eccles Stadium in Salt Lake City, Utah. Going into this matchup, the Utah Utes possess a dominating defense similar to Stanford’s; they lead the country in sacks with 4.88 per game. On the other hand, the Ducks just came off a huge and impressive win over the Cardinal, the team that ruined Oregon’s chances of reaching the Bowl Championship Game for the last two seasons. Tonight the Utes present another big challenge for the Ducks much as Stanford did last week. Offensively, the Utes have a dominant running back in Devontae Booker who’s averaging around 124 yards per game and is the Pac-12’s second-leading rusher. Plus, Utah’s offense has many similarities to Arizona in terms of the spread offense. However, throughout this season the Utes, with their quarterback Travis Wilson, have struggled in passing the ball. On the flip side, when our offense is on the field, Utah can cause Oregon’s quarterback Marcus Mariota potential problems since they lead the nation with 39 sacks and rank second in tackles for loss per game. 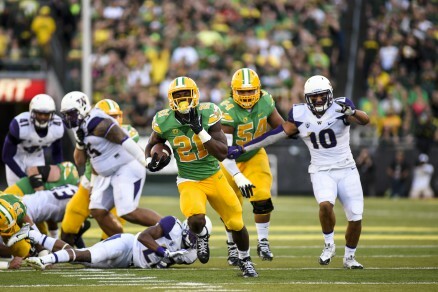 Because of this most Duck fans should not be surprised as Oregon will most likely try to establish a strong running game with running backs Royce Freeman, Thomas Tyner, and Byron Marshall. Since the return of left tackle Jake Fisher, Oregon has recovered from the blocking problems they experienced early in the season. Unfortunately, the Ducks will be without the service of right tackle Matt Pierson tonight as he left the Cardinal game late with a knee injury. Tyrell Crosby, who replaced Fisher when he went down, will step in for Pierson at the right side this time. Oddly enough, the Utes also present challenges for the Ducks in special teams. This season, Utah has been leading the college football world in net punting with 44.42 yards per punt. Punter Tom Hackett of Utah has led the Pac-12 conference by hitting punts within the 10-yard line 14 times and the 20-yard line 23 times. In addition, the Utes All-America returner Kaelin Clay has averaged 22.4 yards per return and is the only player in the nation this season with three punt returns for touchdowns. It’s evident that the Utes’ special teams are special in terms of the amazing stats they’ve put up this year. The Ducks’ special teams unit is also solid with players such as freshman Charles Nelson making pivotal stops and returning the football efficiently this year. It seems that Oregon has recovered, responding with a strong punch after experiencing a disappointing loss against Arizona early this season. 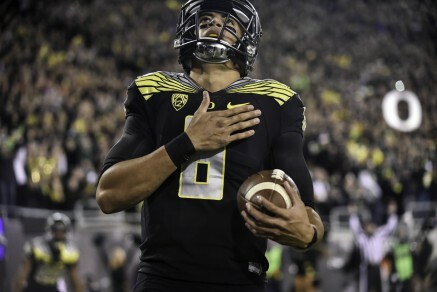 Mariota after scoring a touchdown against Stanford. Just take a look at the Ducks after the Arizona loss! They annihilated UCLA and Cal on the road and then got rid of “The Stanford Demon” that’s been haunting them for the past three seasons. Oregon is now ranked 4th in the nation and is on their way to make it to the College Football Playoff. Is this the ideal situation all Duck fans want Oregon to be in? Of course not! But, we must be proud of our Ducks because they truly are a team that has gotten back on their feet and are playing hard, playing fast and playing together.